Meet the newest member of our family, Cosmo! We adopted Cosmo about two weeks ago from the DuPage County Animal Care and Control (the shelter where I volunteer). 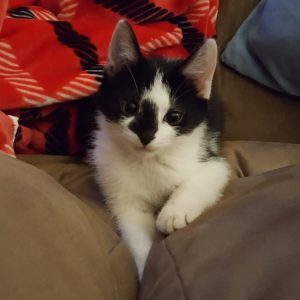 He is a domestic shorthair, almost three months old and a little bundle of joy. My husband and I had been contemplating getting a cat for a while. I have always considered myself an animal lover (our dog is our little princess). I enjoy cats, but never saw myself owning one… until a few months ago when our good friends adopted two kittens. We learned how sweet, loving and playful cats could be. And I knew I wanted one of my own. It took some time to convince my husband, but we agreed we would adopt one if he found the right one. He visited the animal shelter by himself and met Cosmo. We took the plunge and we are so happy we did! Cosmo is the perfect cat for us. He loves to play, cuddle and most importantly he gets along with our dog, Luna. 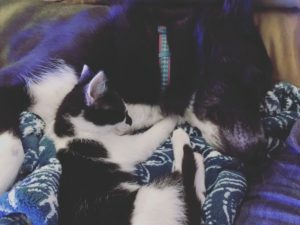 It took some time for him and Luna to adjust to each other but now they are best buds. They love to play with each other and they will occasionally snuggle. I think it’s the start of a lifelong friendship. P.S. as a first time cat owner, I had no idea cats instinctively knew how to use a litter box. All you have to do is show them where it is and you’re set! How cool is that?! And it’s so much easier than house training a puppy.